Texas Agriculture Commissioner Sid Miller faced pointed questions from lawmakers Tuesday over his plan to dramatically hike fees on a host of licenses, registrations and services that his agency provides. 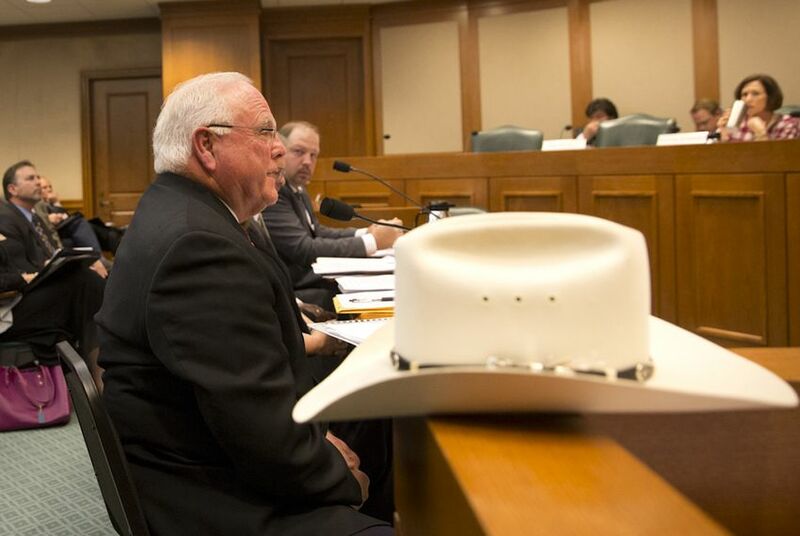 Texas Agriculture Commissioner Sid Miller faced tough questions from lawmakers Tuesday over his plan to hike fees for a host of licenses, registrations and services that his agency provides. Miller, a Republican finishing his first year leading the Texas Department of Agriculture, largely stuck to his guns, insisting that his “hemorrhaging” agency had to raise more than $22 million through fee increases or neglect services. Miller found some sympathetic ears with lawmakers. But others questioned his tactics after the Legislature chose not to fund several programs he proposed during its 2015 session, telling Miller to work on his communication skills. Proposed in October, the fee hikes have prompted outcry from industry groups and dozens of lawmakers who worry the changes could wallop farmers, ranchers and businesses. Critics call the hikes too big and too soon. After the hearing, Miller defended the hikes — including they way he presented them — and said he planned to forge ahead with his proposal, scheduled to kick in Jan. 1. The agriculture department has a wide range of duties, including checking gas pumps for accuracy, verifying that grocery store scanners work properly, checking that metal scales properly display weights, and licensing and certifying agricultural products. The fee hikes would range widely — in many cases adding hundreds of dollars to price tags or more than doubling existing costs. Renewing a grain warehouse license, for instance, would cost $500, up from $235. And prices for field inspections to certify seeds would increase anywhere from a few cents to more than a dollar per acre, while application fees would at least double. Inspectors discovered that about 53 percent of scales at one “large grocery store chain” were out of compliance, Miller testified. He declined to identify the company. “Consumers were not getting what they paid for,” said Miller, his trademark cowboy hat perched at his side. It appears some of the confusion and surprise over Miller’s plans are rooted in his timing. The former lawmaker and rodeo cowboy took over for Todd Staples in January, just as the legislative session was beginning. While settling into office, Miller asked the Legislature for $47 million in new funds — a 50 percent increase. Miller has painted that request as a way to restore massive funding cuts from 2011 — the same cuts he had championed while serving in the Texas House. Lawmakers did approve $1.5 million to bolster weights and measures inspections at the agency. To cover certain costs associated with it — benefits for its employees, for instance — the Legislature boosted the target amount the department was expected to hit in fees by $5.1 million. Miller has the authority to raise fees as much as he sees fit, said Tina Beck, an analyst with the Legislative Budget Board, which provides information and recommendation to state agencies. But agencies typically only increase fees enough to meet the revenue target — in this case $5.1 million, she added. All told, Miller's proposed hikes would generate about $22.6 million. “Our commissioner is using this as an entrepreneurial opportunity to grow these programs,” she said. But Miller said he's only playing catch-up after years of neglect. The money, he said, would only benefit existing programs that suffered under previous budget cuts, adding new employees and tools. Agencies are typically required to submit to lawmakers any proposed fee increases along with their general budget requests. Some lawmakers chided Miller for failing to do that — saying they should have all the available information while making big decisions on budgeting. Sen. Judith Zaffirini, D-Laredo, expressed concerns that other agencies would follow Miller’s lead in hiking fees after losing budgeting battles during the session. “It can motivate a copycat,” she said. Miller said he did not realize the true scope of his agency’s budget woes until months into his first year — namely that fee-funded programs weren’t earning enough to stay afloat. Some fees, in fact, hadn’t been changed since 1996. “The chickens have come home to roost," he said. Miller said increases will stop the programs from losing money and suggested that he would lower the fees if the programs stay in the black. Miller is also asking the Legislative Budget Board for authority to carry over “unexpended balances,” which would allow him to use any extra fee revenue from 2016 to pay bills in 2017. He also wants more flexibility to transfer revenue between divisions. Under the current setup, specific fees can only be used for specific programs — to keep one from subsidizing another — and fees from one year can’t transfer to the next. Though no agency programs earn excess revenue now, Miller says the move would give him more flexibility in the future. Some lawmakers were sympathetic to Miller’s position. Kolkhorst said she believed Miller needed the money but said communication seemed to break down between his office and lawmakers. “How did we go off the rails here? It was that human factor,” she said. But Rep. Larry Gonzales, R-Round Rock, who chairs the House subcommittee that oversees the department’s budget, remains unconvinced that Miller is truly short on cash — even after sitting though the hearing.